There is no better way to learn about and enjoy Cody Yellowstone than to participate in a tour provided by a knowledgeable and professional tour company. 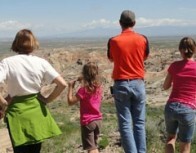 Or choose to go at your own pace on a self-guided tour exploring the treasure of the Old West. Downtown Cody and Powell are both listed on the National Register of Historic Districts. Cody, Wyoming was founded in 1896 by the living legend, Colonel William F. “Buffalo Bill” Cody. Learn, explore and experience the rich Western heritage of the town we call home! The Cody Trolley Tour utilizes two live narrators, poster-sized historical photos, pass-around relics andentertaining audio clips to share the story of world-famous William F. “Buffalo Bill” Cody, while historic sites, scenic vistas, geology, wildlife and old and new attractions are highlighted. Give them an hour, they’ll give you 100 years! Mid-May through late September, daily. Tours at 11:00 a.m. and 3:00 p.m. with an additional 9:00 a.m. and 1:00 p.m. during peak season. Trolley leaves from the porch of the Irma Hotel. Nestled between the picturesque Big Horn and Absaroka mountain ranges of northwest Wyoming, Powell is a community historically rooted in agriculture. The Powell Chamber of Commerce can help you learn more about the agriculture industry in and around Powell by customizing a tour for you or your group. Learn more about area crops, livestock production, irrigation systems and more from local ranchers and farmers. The Chamber offers customized agricultural tours for groups, organizations, families and individuals. Area farmers and ranchers who participate in our agro-tourism ventures realize the value that consumers place on visiting rural settings where food is produced, and they strive to provide tours that are informative, pleasurable and inspiring. Free guided tour of Legend Rock State Archaeological Site. Led by a professional archaeologist and features nearly 300 individual petroglyphs created up to 10,000 years ago. Free guided tour of the former historic Double D Guest Ranch, which operated in the 1930s. Many famous guests stayed there including Amelia Earhart. The tour is led by Jim Dunrud, whose family owned the ranch. Free guided tour of the historic Pitchfork Ranch led by owner Lenox Baker. Learn the history of the ranch as well as restoration efforts currently underway. A visit to the endangered black-footed ferret discovery site is also included. Free guided tour offers an up-close and personal look at the abandoned mining town located in the high Absaroka Mountains. Explore numerous historic structures, mines and alpine scenery. The proposed summer cabin of Amelia Earhart is a short hike away. Two hour, narrated, scenic boat tours in the Bighorn Canyon National Recreation Area located 60 miles east of Cody. Learn about the history, geology and wildlife of this little-known national treasure. Memorial Day weekend through Labor Day. Available Tours: Monday 2:00 p.m., Tuseday – Saturday 10:00 a.m. or 2:00 p.m., Sunday 10:00 a.m.
Sunset cruise Friday and Saturday evenings 6:30 p.m.
Jeep rentals for self-guided adventure tours. Explore rugged backroads through some of the most scenic vistas and landscapes in North America! Detailed trail maps and navigational options, driving tips and seasonal recommendations are offered as well as advice to maximize your time, interests and safety. Ask about the availability of a guided trip. All rental drivers must be 25 years of age or older with credit card and full coverage auto insurance in their name. 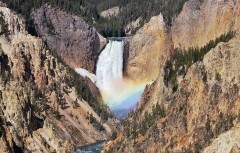 Experience Yellowstone/Cody Country by air! Professional, knowledgeable and personable pilots will ensure an adventure like no other. Book an existing flight tour or customize your own. Whether you want to see wildlife, spectacular scenery, wild mustangs or learn about area history, our local tour companies will provide a safe and memorable journey. 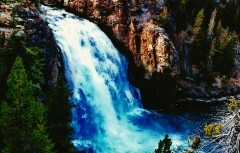 We offer the best Cody-based tours of Yellowstone. We are not the biggest, but the best! We provide shuttle service in Wyoming, Montana and Yellowstone Park. All guides are certified. Yellowstone National Park is a spectacular geological phenomena that is filled with an amazing variety of volcanic activities. It is the first national park, established in 1872, spanning over 2.2 million acres. 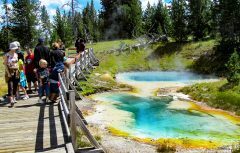 Our adventures take you to exciting sites such as Old Faithful, the Mud Cauldrons, bubbling paint pots and the hottest volcanic spot on the planet, Norris Geyser Basin. On our tours you can view areas such as the lower and upper falls of the Grand Canyon of the Yellowstone River as well as a variety of wildlife that call Yellowstone home. Our 15 passenger van enables your trip to be more personal and provides one on one time with your guide. Park entrance, beverages, snacks, and deli style lunch is included. May – October: 8:00 a.m. to 8:00 p.m. Please call or visit our website for further information regarding this tour or one of our other customized tours. 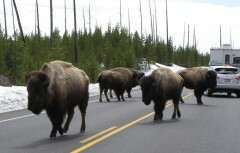 EXPERIENCE YELLOWSTONE offers educational and informative guided natural history tours of Yellowstone National Park. Tours depart daily from Cody Wyoming. After driving the 50 mile Buffalo Bill Scenic Byway claimed by many to be the most scenic ride in Wyoming we’ll be entering the world’s first national park through the scenic east gate. These exciting tours emphasize nature photography, ecology, geology and wildlife viewing. Your tour will be guided by D. Robert Franz who was proclaimed by Digital Photography Magazine as one the 100 best wildlife photographers in the world. During your full day of exploration in Yellowstone’s 2.2 million acres you will see rugged mountains, clear alpine lakes, lush valleys, stunning wildflower displays and the world’s largest concentration of thermal features. The park’s ten thousand thermal features include spectacular geysers, colorful hot springs, bubbling cauldrons, mud pots and roaring fumaroles. 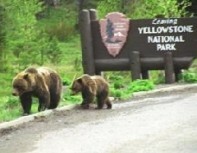 Yellowstone may be even more famous for its world class wildlife viewing. 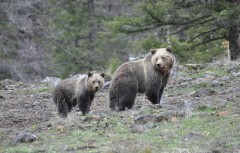 The park is home to grizzly bears, black bears, gray wolves, mountain lions, bison, elk, moose, bighorn sheep and so much more. Robert has been guiding and photographing in Yellowstone for over 30 years and knows when and where to find the animals. Individuals, couples, family and friends are all welcome. Multi-day tours are available. Open May 5 – October 31. K3 Guest Ranch offers area tours for you to enjoy. All tours depart from the ranch. Yellowstone National Park (9 hours) – Yellowstone National Park opens the first week in May and remains open until the first Monday in November, weather permitting. The drive to Yellowstone National Park is one of the most picturesque drives in the U.S. Visit Yellowstone Falls at Artist Point, the mud pots, geysers and Old Faithful. Chief Joseph Scenic Byway (4+ hours) – Follow a rugged section of the Nez Perce Trail along the route taken by Chief Joseph and a band of Nez Perce Indians in 1877 as they attempted to escape the US Calvary and flee into Canada. Travel over the Beartooth Mountains to the Top of The World. You will travel over mountains and valleys and be able to stop many places to view the gorgeous scenery. Legend Rock (5-8 hours) – Located 50 miles southeast of Cody, Wyoming Legend Rock is one of the oldest and best examples of Dinwoody rock art in the world. Wyoming Dinosaur Museum optional add-on. Call for reservations and pricing. We offer tours of Yellowstone, wild mustangs and other attractions of the Big Horn Basin. We have over 30 years of Park experience. Co-author of Yellowstone Yesterday & Today. Call for further details. Private tours of Cody and Yellowstone, area landmarks or Native American sites. Custom trips offering wildlife viewing, history, photography, wild mustangs and winter tours. Step-on guides for charter groups and motorcoaches. Please visit website for reservations and pricing.